Chicken wings… one sure way to make them rock is with some killer spicy BBQ sauce! Tonight I did just that, rocked some chicken wings with Rick’s Real Bar-B-Que sauce. One sure way to get my attention is include a product which says “spicy,” or “hot” or “melts the sun” on the packaging. Tonight I made the wings with the “Extra Spicy” version of Rick’s Real Bar-B-Que sauce. I thought the sauce was great. It did have some heat to it, though for me it was about a 6 out of 10 on the spicy scale. I’d prefer an 11 out of 10 on the spicy scale, but I realize most people can’t handle that. The sauce had some sweet and smoky flavor to it as well, with a hint of chipotle flavor. And a bonus for those who need it, the sauce is gluten free. Thanks to Rick’s. Good stuff. 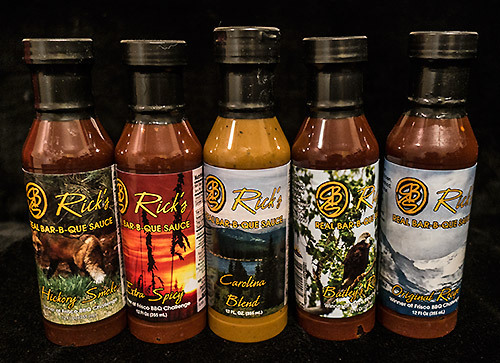 Rick’s Real Bar-B-Que Sauce website.